Continuity mistake: When oil covered Frank breaks off the bike pedals, the pedal straps are thin and non-adjustable. As he slips his boots into them in the close-up, it has a wider adjustable clasp strap. 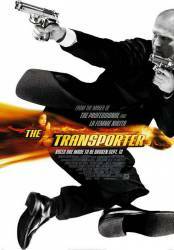 Continuity mistake: When the Transporter jumps from the plane to the truck, the plane is a few feet above the truck. When he jumps it cuts to a shot form inside the plane, but you can see that they are now really high in the air. A split second later they are back to a few feet above the truck. Plot hole: At the end of the film watch the people being released from the container very carefully. Despite being in the container for days on end, not one shields their eyes when exposed to natural sunlight. It would take several minutes for their eyes to readjust. Continuity mistake: When Lai is talking to Frank and crying you see a close up of her face and her cheeks are very wet. They have a reaction shot of Frank and when the camera goes back to Lai her face is completely dry. Continuity mistake: When the bank robbers shoot one of themselves, the blood splatters onto the back window. During the straight after that car chase the blood appears and dissapears from the back window. Wall Street: You can't get anything done in a world without rules. The photos of car owners on the inspector's computer are that of the crew.